Art + Poetry = Puppet Videos! How can teachers integrate the arts in ways that strongly reinforce classroom knowledge, and be developmentally appropriate and exciting for students? In our school, we have HOT Blocks. Those are once a week sessions with lessons designed so all students, especially those in need of academic support, can learn through multiple intelligences and the arts, in addition to conventional methods. HOT Schools integrate the arts across disciplines, creating arts-rich environments that motivate students to make connections between and among subject areas and ideas. For all of the HOT Blocks at our school, the music, art and physical education teachers plan lessons with classroom teachers based on what the students are learning in both classrooms. 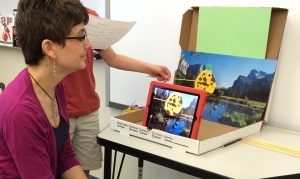 This way, our arts integration HOT Blocks promote deep learning of subject matter, higher order thinking, creativity and learning through multiple intelligences. Students benefit by learning across the curriculum through the arts. My colleague Kelly and I planned this second grade HOT Block around what the students were learning at that time of the year: poetry in language arts and nutrition in science. During our planning of the HOT Block unit, I discovered that they were learning about the parts of a poem, different types of poems, and reading and writing poems with different tone and mood. In science, the students were studying proper nutrition, understanding the five food groups and creating balanced meals. 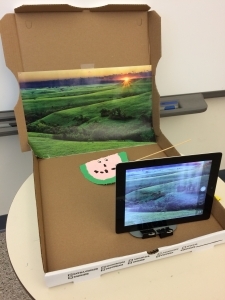 We decided to combine all of these with art and technology for our unit: students would create a fruit or vegetable puppet videos of their choice, write a poem from the perspective of the fruit or vegetable, and finally, practice the poem and make it “come alive” on video. Students created their fruit or vegetable puppet videos with collage. The students drew the shape of their fruit or veggie on a piece of oaktag and cut it out, then used torn construction paper to cover the oaktag. They added stick-on eyes (those were a big hit!) and other details with permanent markers. Next was writing, starting with brainstorming a list of words about the fruit or vegetable, and then writing the poem. The students loved manipulating their puppet videos while creating their poems and practicing them. We did not tell the students that they would be creating their own video until we got to this point. I demonstrated with my puppet videos and a sample poem to show the class how they would create the video of their puppet videos. We used a pizza box “studio” and scenery made from an old calendar. This created a lot of excitement and an important reason to check their work and practice reading their poem! A lot of oral rehearsal was necessary before they “performed” their own video, the children practiced many times. Many read them out loud to get the tone and mood of their poem just right. While some students were still writing or editing their poems, we started to record some of the videos. Getting twenty second graders to be “Quiet on the set!” was easier than I thought. They were very respectful of their classmates because they were so excited to be able to perform with their own puppets. We did add the option for students to ask a friend to work the puppet videos while we recorded, but most of the students read their poem and worked the puppet videos themselves. During our last HOT Block, we viewed all of the terrific fruit and vegetable poem videos on YouTube. The looks on the children’s faces when their video started playing was truly priceless. They were proud, excited, and learning through the arts!